From among the different models and brands of 3 1/4” planers, DEWALT DW680K 7 Amp 3-1/4-Inch Planer is my personal preference because of its high power motor capability, durable construction, and versatility. This review will let you count all the reasons why this planer is on top of its game and why this, too can be the best choice for you. With most of our things and furniture wearing and tearing out as time goes, necessary repairs are needed to get back to its form and design. Buying a new one will waste a good quality of wood and may be more expensive that repairing, which only needs a power tool to do the job and make it brand new again. To achieve this, a good planer will be required. Not just any planer per se, but one that is powerful enough to be used to any type of wood for different furniture and applications. With DEWALT DW680K 7 Amp 3-1/4-Inch Planer, work has been a breeze. It is powerful and versatile enough to do the job for me. DEWALT DW680K 7 Amp 3-1/4-Inch Planer can be a good choice for everybody who is into woodworking and needs a planer that has outstanding components and features that could help make their work convenient and efficient. The heavy-duty motor with 7-amp power and adjustable blades are just two of this planer’s features that make it ideal for heavy duty job and huge intricate detailing required in a professional setting. Its easy to use and convenient functionality makes it user-friendly for home use. And with its power capacity and performance, this planer could already take the entire planing job for any kind of material. Planer’s performance can be based on its power capacity thus, it is important to take this into account when buying this power tool. Planers wit 5-6 amp motor power is already reliable to deliver an outstanding performance and smoother output. With a higher amp, you can be certain that it can give an even better work and higher efficiency. This also allows them to work even on hard materials and in a variety of wood applications. If you are inclined to a professional-quality performance and result, then you may opt for at least 7-amp powered planer as this caliber of power tools are specially designed to take huge tasks and heavy material operations. Planer’s bladecan determine the quality of the output and speed of the planer as well. A dual-blade planer will definitely result to a faster work and more versatile planing as compared to those with single blade. A planer with an adjustable knob will allow you to control the precision of your cuts. The knob is specially designed to let you monitor the depth of your cuts. Some planer has the lock button that will allow it to have a consistent depth the whole time you are planing. Best planers are designed with other features for added comfort, safety and convenience of users. Ergonomic handles, easy blade installation and blade protection are just some of the added components that are a huge advantage when choosing a planer. DEWALT DW680K 7 Amp 3-1/4-Inch Planer is designed for a high power woodwork with 15,000 RPM speed to give you a top caliber of performance, enhanced features and great results with assured accuracy and precision in different applications. Powered by a 7-amp power motor, this DEWALT DW680K 7 Amp 3-1/4-Inch Planer is sure to give you exceptional performance and quality results. With a robust power, this planer becomes a reliable power tool to all kind of materials and applications, working with a top notched accuracy and precision. It also features a 3/32-inches of cut in a single pass, thereby allowing you to increase productivity and efficiency. 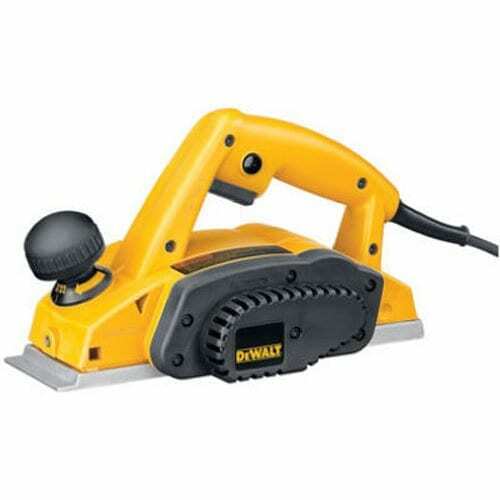 This planer is durable and can withstand frequent usage even on heavy materials and detailed woodwork. It is designed to be compatible and can accommodate both reversible carbide blades and high-speed steel blades that are ideal to use in straight edges and framings. It also comes with a precision-machined shoe that creates even results and perfectly square rabbet joints. And with the three precision machine guides in the front, it generates three distinctive beveling channels for increased efficiency of use. And of course, with its power capability, it is reliable to use for all kind of woodwork be it fixing furniture, planing soft and hard edges or building any project. Also built for convenience and easy to operate, this Dewalt planer has a comfortable two finger trigger for a more relaxed and comfortable use for longer periods. Its other feature is the poly-v-drive belt to boost longevity and a calibrated depth adjustment knob to make sure that positions are fine-tuned and adjusted to how you want to use the planer. These knobs are ergonomically designed in rubber for a comfortable grip and withstanding long fatigue. Some customer has to remove one star out from rating this product because of little details on the planner that need to be improved. One customer pointed out the power cord that was located directly at the back of the planer has the tendency to snag at the back end of the work bench when using for longer strokes. And a lot agreed, that, that cord sometimes get in the way of the work area itself. Overall, performance wise, this planer does a terrific job and better than what you would likely expect it to be. In completing this review, it is just as important to also see other options to guide you through your choices. You may be able to consider these following choices as well. This planer weighs only 8.8 pounds but made to be heavy duty with a 6-amp power motor for an efficient and productive planing. It comes with a dual-side dust extraction for a convenient extraction on both sides of the tool. It has a max speed of 16,500 RPM thus allows fast and reliable smooth material removal. It comes with an over-mold depth knob with 10 positive steps for better planer control and multiple depth control settings. For improved quality, an 11.5” cast aluminum shoe is designed with it for added control when planing. Its kit aside from the planer comes with carbide cutting blades, wrench, dust bag, edge guide and a kit bag. This planer from Bosch is powered by a 6.5-amp motor and a speed of 16,500 for a fast, smooth and reliable finish in either soft or hard woods. It is designed with a dual-mount guide fence with a protective shield for a stable planing of door edges. Other features include the spring –loaded stand elevates tool to protect the blade, a separate inch and metric depth scales for convenient setting of planing depth and an optimally-angled handle for the soft grip of forwarding motion of this power tool. Its package includes reversible wood razor blade, dual-mount guide fence, no-mar plastic overshoe for fence, shavings bag and blade wrench. A powerful planer with a 6.5-amp motor and 16,500 RPM speed, you can be sure that this planer will provide you with a high performance and outstanding results. Its topmost concern is for the safety of its user, as being known to have the first-ever power tool to have the ambidextrous lock-off release button for safe starts and a lock-on button for prolonged operation. It comes with aluminum front and rear shoes precision-machined together after assembly to ensure accuracy. Other features include a versatile two-blade system that can be converted for use with large high-speed blades, spring loaded stand elevates tool to protect the blade and dust ports, which can be found on both sides. Specially made to be lightweight for easy and convenient use, this planer only weighs about 8 pounds but still has the high power 6-amp motor that most planers that are heavy weight has. It also has an increased speed of 34,000 cut per minute for an efficient use. It comes with a 5/16 inch rabbeting guide that adjusts anywhere from 0 to 1 inch to allow rabbets up to an inch deep in size. And with the parallel fence that it comes with, accurate straight cuts are assured to achieve by making sure strokes are directly in line to the edge of the wood. This parallel fence is also essential for planing of door edges and wood trims. This planer is designed with an ergonomic handle to provide ease and lesser user fatigue when holding and using it. It is built with a 5.5-amp power motor and a recorded 34,000 cuts per minute that allows it to produce a fast and smooth finish even on hardwoods. It also comes with reversible carbide blades for increased blade life and added a feature to a smoother output. To ensure the accuracy of cut, it is built with a precision-machined front and back aluminum shoes. A built-in kickstand is also designed to allow its user to rest the planer on work surface without extorting the material. It is also made to be durable for a long time and frequent use with the poly-v drive belt that comes with it. This kit includes the planer, two installed reversible carbide blades, rabbeting fence, blade depth setting gauge, dust adaptor, socket wrench and kit box. We all have different needs and usage of purchasing a planer. Some need it for planing surfaces and edges of a broken door, fixing other furniture or working on a project at home. Whichever, we will need a reliable power planer to help us do the job. It is important to know which one works best not only to save us time, effort and money but a whole lot of worry and stress, thinking how to make it work and why it isn’t functioning at it should be. Bottom line, with DEWALT DW680K 7 Amp 3-1/4-Inch Planer, you can be sure that you are getting your money’s worth on a planer that is powerful, effective and efficient. And with positive reviews and recommendations from its customers, you can be sure that it is exactly what it is advertised.